(BEEKBERGEN, the Netherlands) August 14, 2018—Chester C. Weber, the 15-time U.S. Equestrian Federation Combined Driving Four-in-Hand National Champion, finished his summer competition tour in Europe with a wire-to-wire win in the Netherlands at Beekbergen CAI3* over the weekend of Aug. 10-12. Weber drove Boris W, Asjemenou, First Edition and Splash to an impressive dressage score of 31.20. For the marathon, Weber replaced Splash for Reno, a gelding who has been in his program for about a year. Reno, whose breeding is half trotter and half Friesian, has become a strong addition to Weber’s string, particularly exceling on marathon day. Finishing Saturday with a combined score of 131.60, Weber still led the competitive division of 16 four-in-hand teams from seven nations. Adding only 3 points in the cones phase, they solidified their spot at the top of the leaderboard to win on a total of 134.60. This event was the last of five competitions that made up Weber’s European summer competition schedule. In June, the team placed second in France at Saumur CAIO4*, and in July won the CAI3* Riesenbeck International (Germany), and was sixth at the Aachen World Equestrian Festival CAIO4*. 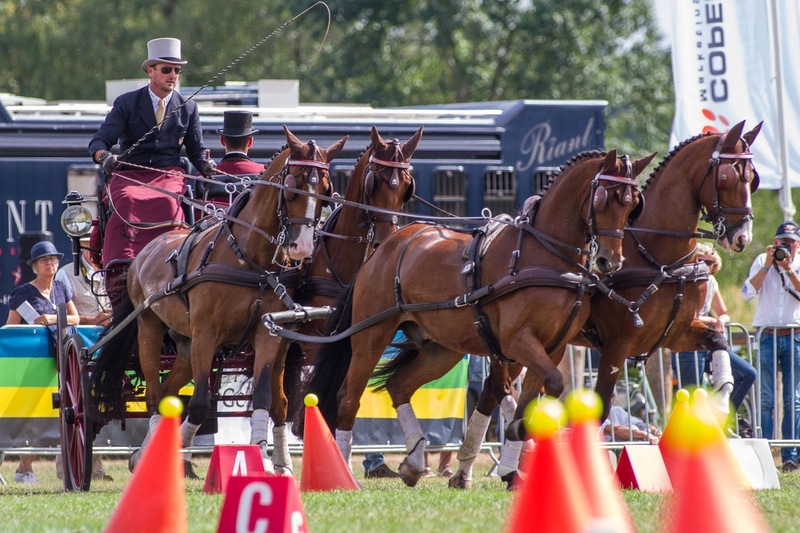 Each of these tournaments also served as qualifiers for the FEI Driving World Cup series, for which, after his recent victory in Beekbergen, Weber is now confirmed eligible. The Live Oak Combined Driving team was based during the summer at Riant Equestrian Centre (NL), where van Tergouw is a proprietor. They will now return to the United States to prepare for the FEI World Equestrian Games (WEG) in Tryon, N.C., held the 11th-23rd of next month. Full results from CAI Beekbergen can be viewed at https://caibeekbergen.nl/en/results-2/. For more information on Chester Weber and Live Oak Combined Driving, visit http://chesterweber.com.